When it became clear that an early game in Omaha was not going to happen, I ran out of steam and stopped in Fort Dodge, Iowa for the night. After getting settled there, the insanity descended and I somehow concluded that it would make sense to go to Colorado the next day, since Omaha was not far enough along to make for an easy following day’s drive and there wasn’t any baseball between there and Colorado. Besides, that would give me the day in the Denver area to goof off, get ready for the Rockies game and mentally prepare for the long two-day drive home. Good plan, right? What I failed to consider was the distance between Fort Dodge and Colorado Springs, which I discovered – the hard way – is about 720 miles. And that’s taking several diagonal “short cuts” (one of which was closed for construction – I either didn’t see or ignored signs, but it was interesting to be the only non-construction vehicle on new pavement for several miles) that shaved some miles off the more common right angle roads in Iowa, Nebraska and Kansas. The early part of that drive was through a frightening thunderstorm with rain, the likes of which I have never seen. But, thanks to gaining an hour going from Central to Mountain time, I made it, just in time for the first pitch at Security Service Stadium, on the eastern edge of Colorado Springs. This stadium is interesting because it is located high above the city (though not with any view of the mountains) at 6531 feet, making it the highest baseball stadium in the country. Unlike any others on this trip, it is named after a local credit union, a long-time sponsor. And it isn’t very big. The seats don’t go much beyond the bases and the outfield wall (based on the sound of several hits bouncing off it) are insubstantial plywood. 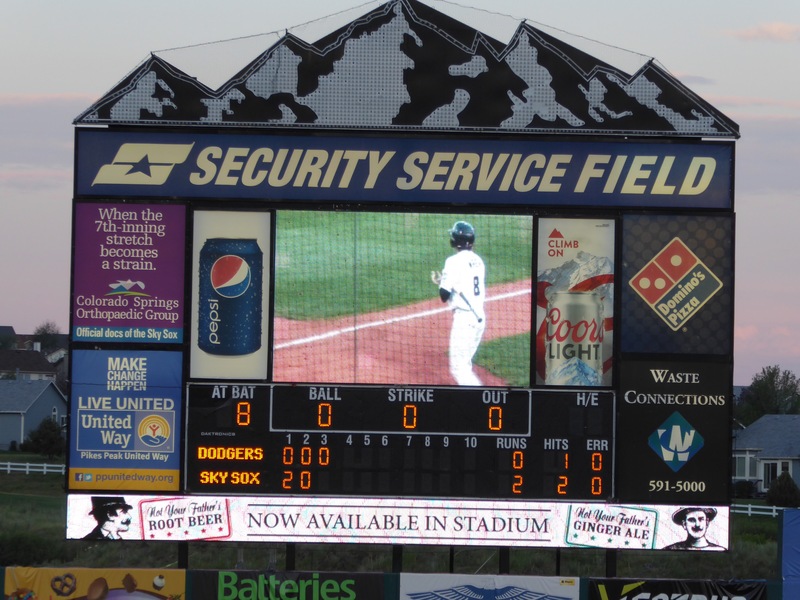 Unlike other minor league parks, the screen didn’t even reach the dugouts, covering only a small area right behind home plate. Oh yes, and the crowd was small, not more than 300-400. The Colorado Sky Sox (Milwaukee Brewers affiliate) took on the visiting Oklahoma City Dodgers (I’ll let you guess the affiliation) in this Pacific Coast League (AAA) matchup. The thin air and less than stellar pitching made for lots of long fly balls, including several home runs. The Sox won 9-4 after falling behind early, slowly chipping away until a big rally in the 8th, but, despite all that offense and several pitching changes, the game took just over 2 1/2 hours. Apparently because both teams are National League affiliates, there was no DH. The picture below shows several items of note: 1) the sparse crowd; 2) seats ending just past third base; 3) grassy slope in place of left field bleachers; 4) 20 second pitcher clock. Once again, as in Albuqurque, there was no obvious enforcement of the pitcher clock, but the game did move quickly. At long last, another outfield ad. This one was so good (when you think about it) that I had to take a picture. Would you want to bat against a pitcher who needed an eye doctor? And then there’s food. Or not. Very limited menu (I chose nachos and got out-of-the-bag chips slathered with liquid velveeta and some other allegedly “Mexican” pre-processed condiments) and of course, Coors beer. Not exciting, except for the fact that I paid big league prices. And another thing. John Nebel pointed out that I failed to mention the most distinctive offering in Detroit. Apparently, the thought of it with the certain ensuing midnight heartburn so traumatized me that I completely blocked it from my mind – fried baloney sandwich! 1. No argument here. 2. You’ve captured true Americana or you’ve truly captured Americana. May it live forever. 3. In my childhood fried bologna was a great treat, surpassed only by a big honking ham size chunk of baked bologna basted continuously with brown sugar and maple syrpul. And this was for dinner, fixed by my dad. Bob, you have run the gamut of America’s baseball experience. You’ve gone to look for America and you’ve found it. Here’s hoping not too much of it is Trump country. In any event, your trip continues to be one that sparks appreciation, admiration, and envy. I gotta think that in its own way this must rank up there with the ‘stans and South Sudan. What have they got that our Heartland ain’t got? Your reporting has been superb. Make sure to keep a hard copy of all this to read when you are in the home. It’s been perfect. You’ve been bobbin’ along, singing your song. It’s all been enjoyable to read and a masterpiece of observations. Now, don’t forget to stop at the world’s deepest hand dug well and find out if Utahans really like Hillary.. And another thing . . . Do it again next year?